"Infinite Place: The Ceramic Art of Wayne Higby"
Four decades of work by ceramic artist Wayne Higby are represented in the Memorial Art Gallery's show, "Infinite Place," and honestly, there's not a thing he's done that I didn't feel all swoony about. The exhibition begins with a trio of examples from Higby's early work, created in the late 1960's, and inspired by world travels. "The pot, like a footprint in stone, signifies the presence of humanity," Higby says in a provided statement. His "Inlaid Luster Jar" carries spiral motifs ubiquitous throughout the planet's ancient cultures, has nubby vestigial handles, and shimmers darkly with a subtle opalescence. Higby's well-known work through the 1970's and 80's was inspired heavily by his travels through the American West during the tail-end of the 1960's. Landscape imagery makes its appearance and sticks, and Higby develops a knack for folding and tucking infinite vistas into the familiar forms of the bowl and the box. His ceramic boxes would evolve into complex clusters of cases forming abbreviated landscapes, unfolding like — and inspired by — Chinese screen paintings. But the first few were solitary, structured forms, with bursts of breakout shapes. "Triangle Springs" contains a brilliant interplay of levity and heaviness. The body of the box forms a landscape with a lake and meandering streams. A gray rainbow forms the handle on its lid, and is capped with a stone-colored cloud. "Flash Flood Flats," made in 1975, is a wide, low, open box, the lip of which forms an undulating line of mountains. Inside and out, the work is painted to resemble a continuous terrain of hills and a basin through which a thin stream runs. As the viewer walks around the work, the way the folded landscape matches up with itself shifts with each perspective. In the 1988 work, "Tower Lands Winter," five tall boxes are lined up and angled to touch at their corners. The scenery here is ice-capped cliffs above impossibly blue water, and the raku-fired white glaze is overrun with crackling patterns that resemble frost. Not only do the jars' lids serve as flat mesas, but the sides of the works are glazed to resemble cliff tops that are closer in space. Wayne Higby's "Return to White Mesa" is part of "Infinite Place," currently on view at the Memorial Art Gallery. The exhibition is the first major retrospective of Higby's forty-year career. "White Mesa" (1975) is a round, imperfectly spherical vessel glazed to resemble cliffs cut by a snaking river, the vast scene bending over the jar like its own little planet. 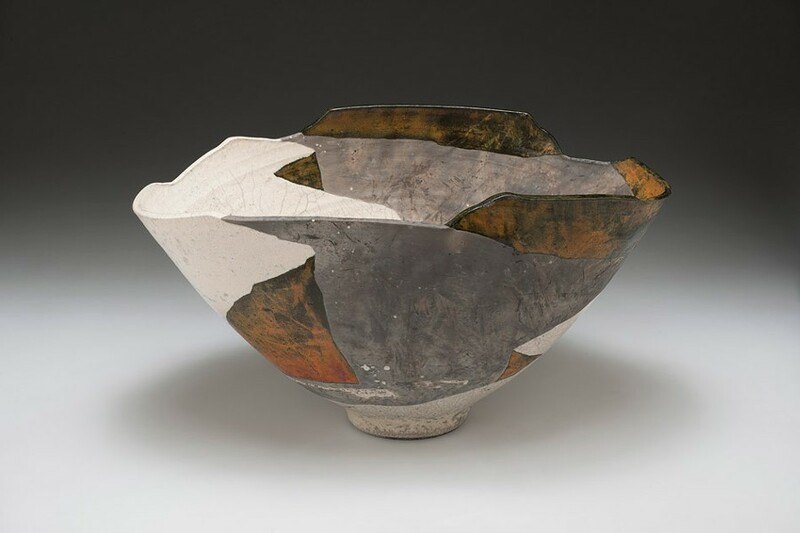 In "Return to White Mesa" (1978), the form is that of a large bowl, softly bowing out slightly like the cup of a flower opening wider. Higby urges perfect stone texture and tones from his materials — the sunbaked white mesa contrasts sharply with the richly warm, earthy hues of the scarred rock face. Gazing down into the bowls, I felt a slight sense of vertigo; the work gives the disorienting feeling of being larger than and far away from the represented space, as well as insignificantly small, standing amid the cliffs and looking out into the sweep of forever. Soon, Higby's bowls "began to take on the contours of the landscape they evoked," the curators write in wall text. In the 1991 work, "Emerald Tide Beach," the typically even sides of the bowl are broken up by bulbous forms, which play up the ruggedness of rocks in contrast to the smoother sweeps of sky and water. Higby is a master at compressing expansiveness, and of packing a lot of visual information into very sparse colorful forms and textures. No matter how pared-down the elements, you know exactly what you're meant to see. Later, Higby's work moves in even more minimalist directions, while still retaining the wealth of impressions it offers. For his "Lake Powell Memory" series, he took an unorthodox approach to working with porcelain. While the medium is prized for its delicate nature, often worked into a fragile, sugar-crust-like thinness, Higby sliced the clay into thick slabs and allowed the kiln-firing to raze the surface, replicating the cracked severity and crumbliness of ancient rock. These pale, largely monochrome forms resemble cliffs and waterways spied through the mist of recollection. The texture Higby worked into the milky glaze in "Lake Powell Memory — Winter Rain" perfectly depicts a rain-streaked canyon with infinite ripples where the drops hit the water. You can almost hear and smell the chilly patter. Higby's ambitious, panoramic "EarthCloud" installation — created in two parts in 2006 and 2012, and installed in adjacent performing arts buildings at Alfred University — includes more than 12,000 porcelain tiles, and is represented here in photos and sculptural sketches, complemented by ethereal ink drawings of solitary clouds. The installation is reminiscent of the ever-shifting nature of matter, and suggests everything from various cloud types, to rough cliff faces, to frozen water breaking up against itself when disturbed by a relentless tide. Craggy slabs of the shimmering clay jut from the wall, stacked and seeming about to topple. Some areas are painted with gold luster, others remain raw, and still others shine with soft celadon glaze. Though much of Higby's work speaks of silence and stillness, his 2009 installation, "Sky Well Falls," has an immediate kineticism while maintaining a minimalist approach. The work is represented here in two installations, in which a grid of rich, blood-colored tiles soar to the ceiling. The vibrant work feels alive. Parallel, perfect streaks in low sculptural relief depict the cascading water, and a galaxy of dots, each enhanced with specs of pearlescent glaze, create an epically shimmering spray. A separate room is filled with Higby's graphite rubbings from marked plaster slabs on paper — which gently reveal water, canyons walls, rocks, and rain as if mythical places fading in and out through heavy mists — and other examples of the sculptor's lovely draftsmanship are found throughout the exhibition.